. I am blind and so the video isn't of much use. Does anyone know if there is an Hogwarts Express in N scale? The locomotive is an GWR design 4-6-0 Hall Class painted a very unprototypical red (crimson?). 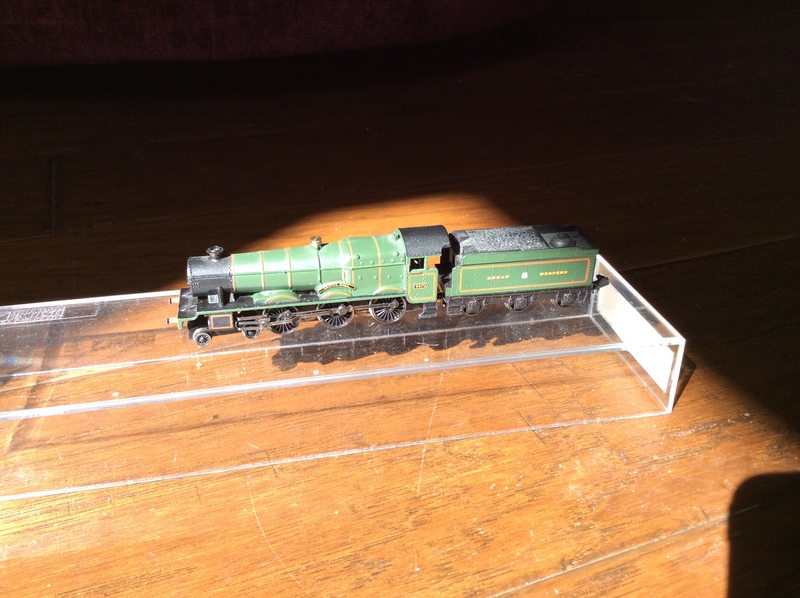 The locomotive itself is available in N gauge from Dapol, but not in Hogwarts livery. The coaches are BR-design Mk1s in Maroon, available from Graham Farish (owned by Bachmann). Sorry to pick up this thread after a long time. Are any of these the correct engines that I can have repainted? Nope, the Grange is a different class. I have a feeling they shared some components but they're not identical. It might pass as "close enough" depending on your preferences. If you find a photo of a real Hall class to compare to it should help. One tip if you do go for an old Farish Hall, the earlier ones used a brass gear on the axle which, unlike some of the plastic ones, isn't prone to cracking. Graham Farish are coming out with Castle Pullman set. I am guessing this is different from Hall class too? Yes, the Castle is a larger engine than the Hall. There are also differences to the feed pipe to the cylinders at the front and number of cylinders. Ironically, the Hall used by the film makers was renamed Hogwarts Castle, so it's a Hall masquerading as a Castle! I think I found a couple of pre-owned hall class. The Farish model there is a very early one, so it'll be a lot cruder than the Dapol version. It may be a more robust runner though! I agree the Farish example is cruder, but things can be done to improve it...new pony wheels for example. You would also need to repaint it, obviously. It would make a good basis for a nice little project. Note, however, that Hatton's are by no means the cheapest when it comes to second-hand N gauge. I will keep this thread updated with progress. I have them both ordered. The Hogwarts Express will be available this year from Hornby, but in OO scale. Hornby doesn't do N scale. That is too bad! Maybe someone else will do N scale. They do via their Arnold brand, and for the UK have done the Brighton Belle in N as well as scenic accessories.